The blue marks on WhatsApp caused problems between me and my friends especially if I take long to reply. I have no idea why they introduced them because they brought more bad than good according to me. Sometimes back Airtel and Safaricom were worried after news came out that WhatsApp could enable calls. WhatsApp has introduced yet another feature known as mark as unread where users mark messages as unread, but senders will still know you’ve read them. 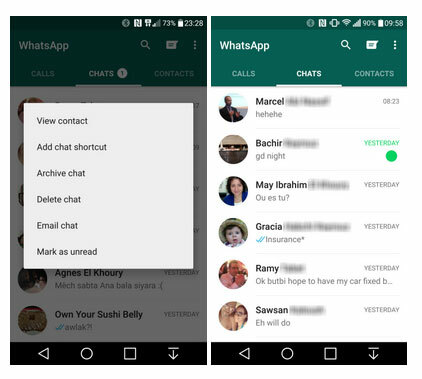 WhatsApp rolled the new feature to its instant messaging app for Android that allows users to mark messages as “unread”. How it works is simple, by tapping and holding any conversation, users can switch it its status to “green”, serving as a visual reminder to respond to the sender at a later time. The marks will not change the message inside the chat. Any messages that have been seen by the recipient will appear with two blue ticks next to them. The Mark as Unread feature is one of the advancements WhatsApp has developed this week. The other updates include the ability to “mute” a conversation for eight hours, one week, or one year, and to assign ringtones, vibration lengths, lights or popup notifications to specific conversations and low data usage option for voice calls has also been added. WhatsApp is currently the most popular instant Messaging App with more than 800 million monthly active users. In case you don’t know what the ticks mean, well a single grey tick now represents that the message has been successfully sent, while two grey ticks mean it has been delivered to their phone. Once the ticks turn blue, the recipient has read your message. The App faces a number of challenges despite it being most successful. A new legislation could see the app banned in the UK unless the company agrees to give British intelligence agencies access to encrypted communications. Home Secretary Theresa May announced that a draft for a new Data Retention and Investigatory Powers Act (DRIPA) will be published in the Autumn, with a view to introducing a Bill early in the New Year, or by December 2016 at the latest. The Communications Data Bill proposed that communications service providers to store all details of online communication in the UK including the time, duration, sender and recipient of a communication, and the location of the device from which it was made for 12 months. Reports The Telegraph.